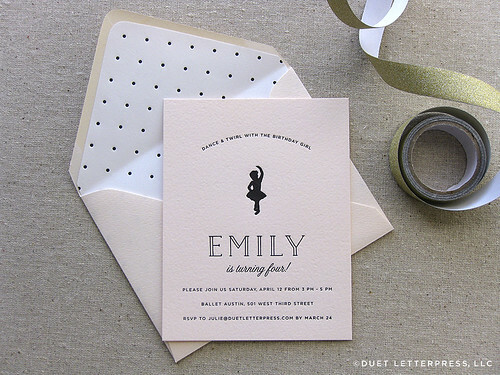 Today, I am excited to share with you the invitations we designed + letterpress printed for our daughter’s fourth birthday party. Plus, I’m sharing a few other paper pieces from her celebration. This year, we decided to throw a ballerina birthday bash for our little girl since she adores dancing. We try to use her invitations as an opportunity to experiment with something new. Last year, we did a five color print job. 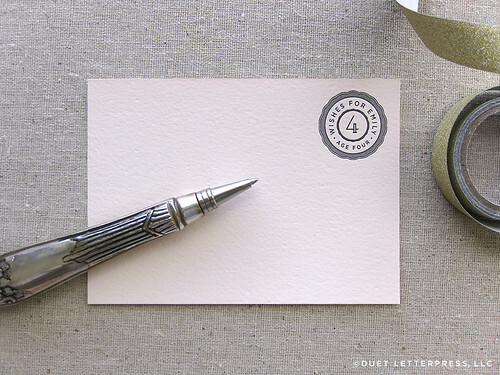 This year, we lined the envelopes with custom letterpress printed paper. We chose a soft pink Italian paper for her paper pieces and printed with black ink. The silhouette is really Emily! I made it using an actual photo of her in fourth position. Fourth position for her fourth birthday. I love little details like this. So, I couldn’t pass up the opportunity. Again, like previous years, we had wish cards for guests to write their wishes for Emily. It was fun to read them together after the party. 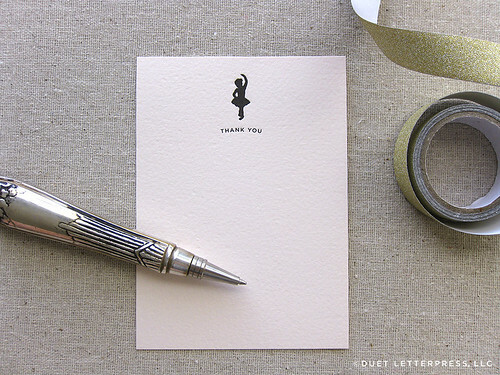 Lastly, the thank you cards featured her silhouette to continue the theme. So, here they are. 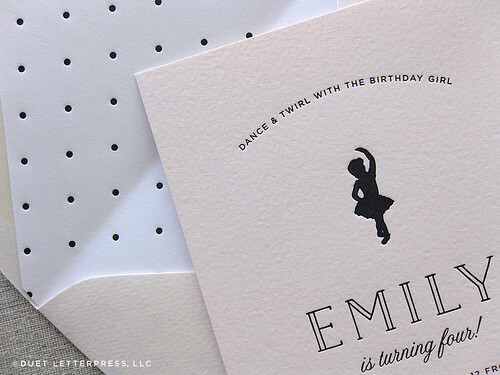 Em’s letterpress printed invitations + paper pieces for her ballerina birthday bash! This entry was posted on Friday, June 6th, 2014 at 1:51 pm	and is filed under letterpress, parties. You can follow any responses to this entry through the RSS 2.0 feed. You can leave a response, or trackback from your own site.